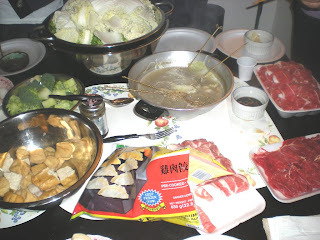 A few weeks ago, my Taiwanese friend thought of organizing a hot pot, a great economical idea. The idea here is that everyone bring whatever leftover they have in their fridge and share it with others. The concept of hot pot is very simple. A pot of simmering water or broth is found at the middle of the table. Basically, you place a few uncooked ingredients in a wired or slotted spoon and cook in the pot. 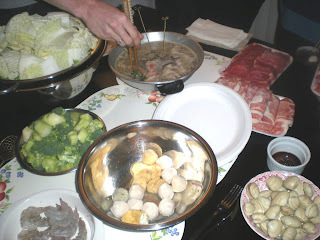 Any ingredients can be put in a hot pot as long they do not take too long (more than 5 mins) to cook. That day, we brought 3 new students to our cooking gather up. Two exchange students and my neighbour lab physicist. We were in total 10 people for the hot pot, it is probably the largest group we ever had since the first organization of the collective cooking since last October... hmmm...I just realize while writing this post that it has been now a year of collective cooking organization. Wow, what an accomplishment! Okay, back to the fondue, the cooked ingredients are usually eaten with a dipping sauce. There are two popular dipping sauce that my family uses everytime we have a hot pot : ginger sauce and oyster-soy sauce. For the oyster-soy sauce, mix 1:1 oyster sauce : soy sauce. Serve on ramekin or dipping bowls for each person. Anyone can organize a hot pot at their home, all you need is an electrical pot or portable stove. 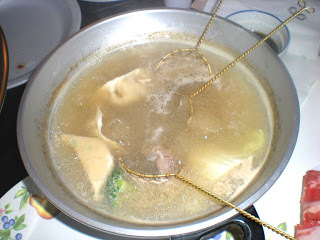 Add water with herbs or broth in the pot, boil and then bring it to a simmer. The liquid can start spicy, peppery, salty, barbecuey or any combination of flavour, so get your guests entertain. The special part of the event is at the end when everyone is full. The liquid becomes a soup, you can taste all the food that were dipped since the beginning of the evening. All in all, we had a great time. 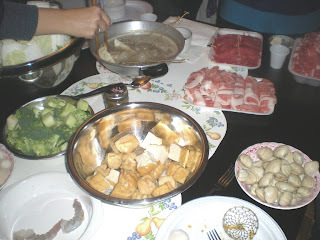 I hope this post will help you readers to organize chinese fondue night. I love hot pot, called Steam boat in Malaysia. It's getting very cold...time to pull out my pot again. My family loves this...easy to prepare and fun to eat and awesome to feel warm. Yum, I love fondue but never thought of having it like this -looks great! This is such a great communal meal! Cooking and eating is always more fun when everyone is involved. I've done cheese fondue, and also "fondue bourguignone" (where you cook beef in boiling oil) at home, but never Chinese fondue (though I've had it at restaurants). What a great idea, especially now that it's getting chilly! Love hot pots! My family insists on having this for every single holiday - Thanksgiving, Christmas, Chinese New Year. It's so versatile and possibilities are endless! I just recently found a fiery Sichuan version of hot pot that I am dying to try! Love the idea of having everyone bring something to cook in it!